Whether they are dust mop heads, wet mop heads or a microfiber option, having these available can soak up the chance of a slip and fall accident occurring in your facility. According to OSHA, (The Occupational Safety and Health Administration) slip, trip and fall accidents cause 15 percent of all accidental deaths. If this type of accident were to occur in your workplace or facility, it could end up costing you. Not only could your financial security be on the line, but also your brand and reputation. Investing in commercial mops can save you from this potential burden. Unexpected problems such as a water spills and sticky substances need to be addressed quickly and efficiently. This is where the proper mops come in. Having mops on hand that are equipped to handle any situation can save you time and money in the long run. Not only is it important that they absorb any spills, it’s crucial that they properly scrub and clean, leaving no residue behind. This way your floor will continue to be clean, dry and safe for customers. Knowing potential problems are being cleaned up the right way will allow your facility to be protected from unknown slip and fall dangers. 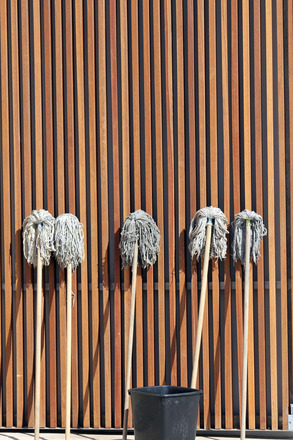 Which Mop is Best for me? Since you never really know what kind of spill or mess will come your way, it’s important to be prepared no matter what. There are many kinds of mops that perform different duties. Below we have outlined some of our products and the features, purposes and benefits they include. Used to clean wet, dry or sticky substances. Looped ends create added value to their performance. Able to clean large area. Saves on time and money. Removes dirt, dust and debris. Traps dirt, dust and debris. Can reach hard to clean areas. Looking for another way to save money while cleaning large areas? Discover our Mopster Microfiber Bucketless Mop System.